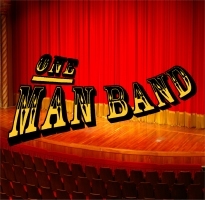 ONE MAN BAND CD now available! The One Man Band (Peter Haskell - BMI) - Some may characterise this bouncy shuffle as a love song, and justifiably so. But it is really dedicated to all the musicians I have worked with in the past and how much they are missed when I play my solo gigs. A Date With Frendora (Peter Haskell - BMI) - A medium jazz feel, this is a true story about a blind date. It actually happened to a friend of mine while we were serving in the U.S. Navy together. I think he told the story much better than I do but then I think you can get the gist of it from this little ditty. You Can't Push The River (Peter Haskell - BMI) - An easy listening jazz oriented song about the futility of impatience. I have always been in a hurry since I can remember. My fifth grade teacher once made me write on the blackboard, 100 times, "Haste Makes Waste". The Classic Cafe (Peter Haskell - BMI) - This is a doo-wap song in the style of the '50's. It is a nostalgic look at an old romance and the place the lovers used to meet. It is named after the cafe I was playing at the time of it's writing, a wonderful '50's Theme restaurant located in Southport, NY. Back In Your Arms Again (Peter Haskell - BMI) - This slow dreamy ballad was the result of a dream I had in which I was reunited with an old flame. I thought of the words and the melody simultaneously when I revisited the memory of it. I think it's more about feeling safe and in familiar territory than anything else. Old What's Her Name (Peter Haskell - BMI) - When I wrote this one I was shooting for a bluegrass feel with this tongue-in-cheek ditty about a guy who is desperately trying to forget someone he had obviously been heavily involved with in the past. My Understanding Heart (Peter Haskell - BMI) - This bossa nova is dedicated to someone very special left behind in my quest to make a living at this difficult profession as a professional musician. I think it speaks for itself. In Walked You (Peter Haskell - BMI) - A Barry White structurally inspired song that is dedicated to my wife, Janet, my number one fan without exception. It was inspired one day when I was trying to write and when she walked in the door the song just came to me. Down At Lulu Belles (Peter Haskell - BMI) - A psuedo-rock song in a harmonic minor key about a tavern I played in Buffalo, NY in the early 1960's. The owners were an ex-carney, Bud Towers, and his wife, Pauline, from Tyler, Texas who collected all sorts of junk and hung it all over the walls and ceiling. A Rock And A Hard Place (Peter Haskell - BMI) - A country flavored song with political overtones about a relationship with communication problems. The implied message is one of regret that the very genesis of the problem predicts the inevitable outcome. All songs, words and music written by Peter Haskell. All songs arranged and produced by Peter Haskell. All songs copyrighted © 1991-2013 by Peter Haskell. Use of songs for any commercial purposes without written permission from Peter Haskell is an infringement of copyright. All songs are licensed by Broadcast Music.